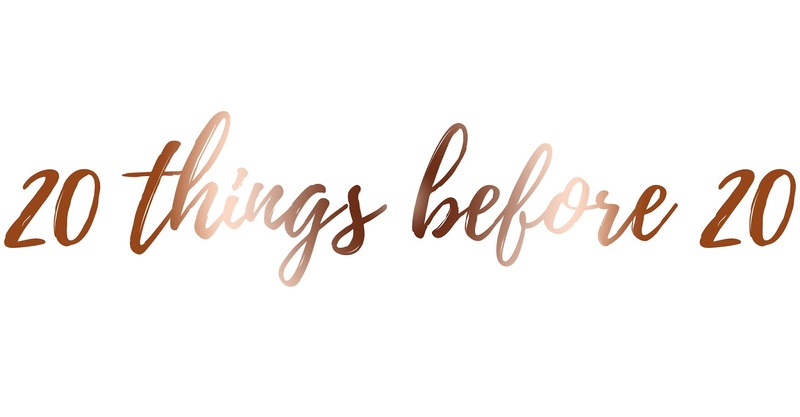 I recently saw this post going round my Bloglovin for people turning different ages and I thought it would be a perfect way to create pretty much a bucket list for before I turn 20, which is in June! Eeek, not far away! There isn't a lot in my personal life which I want to do before I turn 20, therefore I'm going to make this a lot more broad and choose blog goals and personal life goals I want to do in the next four months, or hopefully try to. Some are ridiculous and I can do them in a week, or even a day but some I need to put more effort and time into and to be honest, just do them. 1. Go to the Harry Potter Studio Tour. 2. Pass my second year of University. 3. Go to a blogger event. 4. Meet M11 (Oh Fab). 5. Read at least 5 books. 6. Hit 100,000 blog views. 7. To feel comfortable in my own skin. 8. Spend the day in London (or a weekend). 9. Pick up a new hobby way outside of my comfort zone. 12. Wake up at 7am every day for 21 days. 13. Ride my bike more than three times a week. 14. Go somewhere new and different. 15. Bake something I've always wanted to bake but never ever did. 18. Walk round the whole of Hatfield Forest. 19. Make more time for myself. 20. Spend time with someone who used to mean a lot to me. Can you think of 20 things you want to do before your 20th birthday? Going to the Harry Potter Studios has been on my list of things to do for a while now too - I've only heard good things!